Apple reports environmental impact comprehensively. We do this by focusing on our products: what happens when we design them, what happens when we make them, and what happens when you take them home and use them. 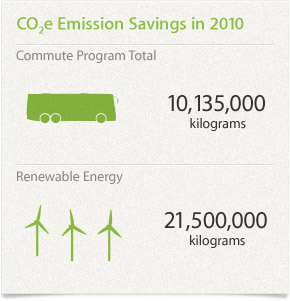 How we calculate our carbon footprint. To accurately measure a company’s environmental footprint, it’s important to look at the impact that company’s products have on the planet. For the past three years, Apple has used a comprehensive life cycle analysis to determine where our greenhouse gas emissions come from. That means adding up the emissions generated from the manufacturing, transportation, use, and recycling of our products, as well as the emissions generated by our facilities. 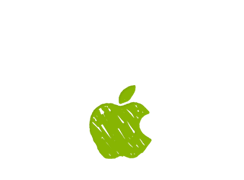 We've learned that about 98 percent of Apple's carbon footprint is directly related to our products. The remaining 2 percent is related to our facilities. The vast majority of our carbon emissions come from the manufacturing, transportation, use, and recycling of our products. The rest — 2 percent — come from our facilities. Manufacturing — including extraction of raw materials and product assembly — accounts for 46 percent of Apple’s total greenhouse gas emissions. Over the past decade, Apple’s designers and engineers have pioneered the development of smaller, thinner, and lighter products. 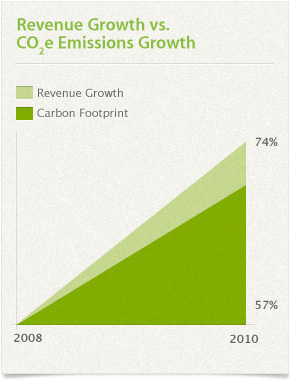 As our products become more powerful, they’re using less material to produce and generating fewer carbon emissions. For example, although today’s 21.5-inch iMac is more powerful and has a much larger screen than the first-generation, 15-inch iMac, it is designed with 50 percent less material and generates 50 percent fewer emissions. Even the iPad became 33 percent thinner and up to 15 percent lighter in just one generation, producing 5 percent fewer carbon emissions. Designing greener products means considering the environmental impact of the materials used to make them. From the glass, plastic, and metal in our products to the paper and ink in our packaging, our goal is to continue leading the industry in reducing or eliminating environmentally harmful substances. One of the environmental challenges facing our industry today is the presence of toxic substances such as arsenic, brominated flame retardants (BFRs), mercury, phthalates, and polyvinyl chloride (PVC) in products. Although most countries still allow use of these substances, we have worked with our manufacturing partners to eliminate them from our products. Not only is every product we sell free of BFRs and other harmful toxins, we have also qualified thousands of components to be free of elemental bromine and chlorine, putting us years ahead of anyone else in the industry. In addition, every display we make — whether it’s built into a system or available as a stand-alone — features mercury-free LED backlighting and arsenic-free glass. Apple is committed to ensuring that working conditions in our supply chain are safe, workers are treated with respect and dignity, and manufacturing processes are environmentally responsible. View our Supplier Code of Conduct as well as our supplier audit reports at the Supplier Responsibility site. Apple's attention to product design has led to significant reductions in carbon emissions compared with previous-generation products — even though new products are more powerful than ever. 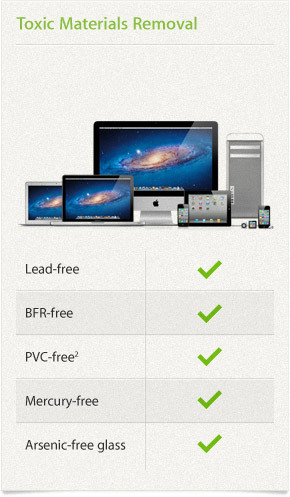 Our entire product line — Mac, iPod, iPhone, iPad, and accessories — is free from many toxic materials used by others. Six percent of Apple’s greenhouse gas emissions are a result of transporting our products from assembly locations to distribution hubs in regions where our products are sold. Apple employs teams of design and engineering experts who develop product packaging that’s slim and light yet protective. Efficient packaging design not only reduces materials and waste, it also helps reduce the emissions produced during transportation. 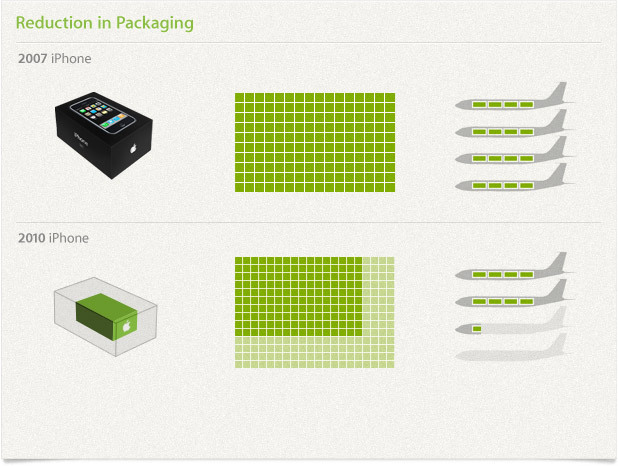 For example, the packaging for iPhone 4 is 42 percent smaller than for the original iPhone shipped in 2007. That means that 80 percent more iPhone 4 boxes fit on each shipping pallet, more pallets fit on each boat and plane, and fewer boats and planes are used — resulting in fewer CO2 emissions. Apple’s A5 chip in iPad 2 and A4 chip in iPhone 4, iPod touch, and Apple TV are another example of energy-efficient design. Apple engineers designed the A5 and A4 chips to be extremely powerful yet remarkably energy efficient. With them, your Apple devices can perform complex jobs while maximizing battery life. *Calculated while system is idle and has completed loading its operating system; for products with displays, the display is set to its full brightness. Assumes CO2e emissions generated from an average mix of power grids in the U.S. See our Product Environmental Reports for detailed power consumption information by product. One percent of Apple’s total greenhouse gas emissions are related to recycling. Apple’s approach to recycling begins in the design stage, where we create compact, efficient products that require less material to produce. And the materials we do use — including arsenic-free glass, high-grade aluminum, and strong polycarbonate — are reclaimed by recyclers for use in new products. Even our product packaging uses recyclable materials wherever possible. Apple designs products that last. The built-in battery in our MacBook Pro lineup is a perfect example. Other notebook batteries can be charged only 200 to 300 times. The MacBook Pro battery can be charged up to 1000 times.6 And because this battery lasts up to five years, MacBook Pro uses just one battery in about the same time a typical notebook uses three. That saves you money, produces less waste, and increases the lifespan of your MacBook Pro. All e-waste collected by Apple-controlled voluntary and regulatory programs worldwide is processed in the region in which it was collected. Nothing is shipped overseas for recycling or disposal. Our recyclers must comply with all applicable health and safety laws, and Apple does not allow the use of prison labor at any stage of the recycling process. Nor do we allow the disposal of hazardous electronic waste in solid-waste landfills or incinerators. Once an Apple product reaches the end of its useful life, we will help you recycle it responsibly. Apple has instituted recycling programs in cities and college campuses in 95 percent of the countries where our products are sold, diverting more than 84,853 metric tons of equipment from landfills since 1994. 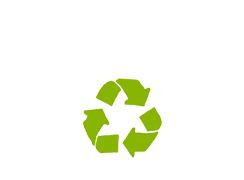 Our original goal for 2010 was to achieve a worldwide recycling rate of 50 percent. (To calculate this rate, we use a measurement proposed by Dell that assumes a seven-year product lifetime. The weight of the materials we recycle each year is compared to the total weight of the products Apple sold seven years earlier.) We exceeded that goal in 2009, one year earlier than projected, when we achieved a rate of 66.4 percent. This far surpasses the last reported numbers from Dell and HP, which were each lower than 20 percent. In 2010, Apple global recycling exceeded our 70 percent goal, and we are confident that we will maintain this level through 2015. *As percentage of weight of products sold seven years earlier. Apple’s facilities — including corporate offices, distribution hubs, data centers, and retail stores — account for 2 percent of our total greenhouse gas emissions. Facilities in the big picture. Companies such as Dell and HP primarily report on their facilities as a gauge of their environmental impact. But switching off lights and recycling office waste aren’t enough. The products we make represent the biggest impact on our environment. That’s why Apple focuses on product design and innovation. Even so, Apple has taken significant steps to lessen greenhouse gas emissions produced by our facilities worldwide. Apple reduces energy use in our facilities in a number of ways. Currently, our facilities in Austin, Texas; Sacramento, California; and Cork, Ireland, are 100 percent powered by renewable energy — eliminating 21,500 metric tons of CO2e emissions. In addition, Apple continues to install state-of-the-art digital controls, high-efficiency mechanical equipment, and monitoring technology. Of course, we use energy-efficient Apple computers in all our facilities. Apple offers its employees several commute alternatives. Many employees take advantage of our public transportation incentives. 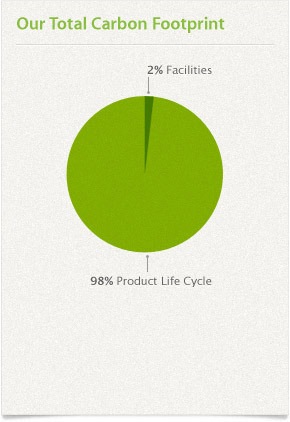 And each day, over 900 Apple employees ride our free biodiesel commuter coaches. We estimate that our commute programs have eliminated the CO2e equivalent of 1906 single-occupant cars from the roads each day — or 10,135 metric tons of CO2e emissions avoided per year. Get answers to your questions about Apple and the environment. 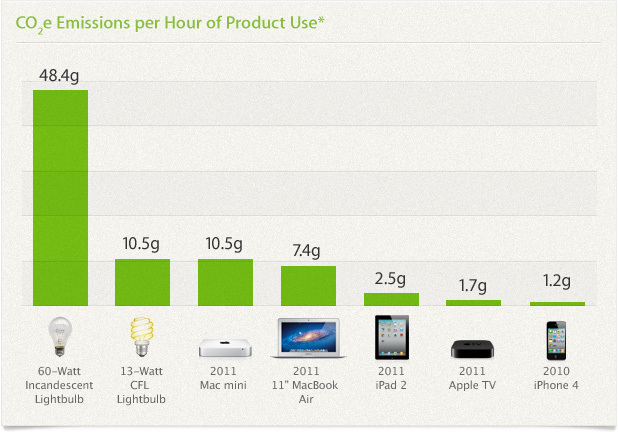 Learn about the environmental performance of Apple products. get an Apple Gift Card in return. Find out how Apple ensures social responsibility across our supply base. Greenhouse gas emissions are calculated in accordance with guidelines and requirements as specified by ISO 14040 and ISO 14044. Calculations include emissions from production, transport, use, and recycling of Apple products, as well as emissions from Apple facilities and employee travel. Emissions from product use reflect power consumed over three years for handheld products or four years for Mac computers and other products sold in the previous fiscal year. PVC-free AC power cord is available in the U.S., Canada, Mexico, Colombia, El Salvador, Guatemala, Panama, Puerto Rico, U.S. Virgin Islands, and Venezuela. All other countries have PVC-free internal cables. 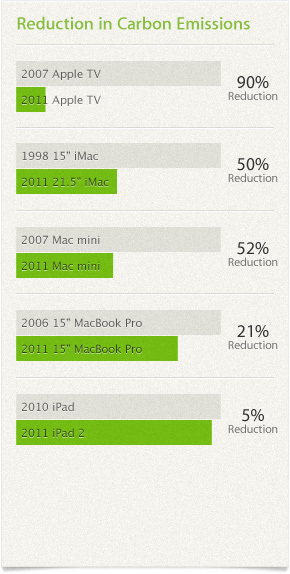 Calculation based on four years of use for a Mac and three years of use for an iPhone, iPod, or iPad. Based on an incandescent 60W lightbulb. Claim based on energy efficiency categories and products listed in the EPA ENERGY STAR database as of July 2011. Apple does not warrant the battery beyond Apple’s one-year Limited Warranty. The battery has a limited number of charge cycles and may eventually need to be replaced by an Apple Service Provider. Battery life and charge cycles vary by use and settings. See www.apple.com/batteries for more information.